The story of two brothers, called Jeromy and Joseph, who catch a fish. It tells them that if they allow it to swim free they will find two horses on the beach the next day with which they can seek their fortunes. During his travels Jeromy manages to save a Princess, who is about to be eaten by a six headed monster. He presents himself before the King with her, but instead of thanking him for his courageous deed the King isn't happy and sends him straight to prison. 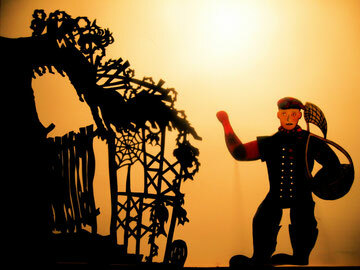 The Two Brothers is a shadow show freely adapted from a sicilian tale. the puppets and does the voices, and someone in front of the audience who tells the story and does the sound effects with a wide variety of instruments. A mouse wakes up a lion so that it will roar to announce the beginning of the show, but it has a frog in its throat; a man rolls a rock up a hill but it always rolls back down, in the end the rock becomes a balloon which carries the man away; a scottish watering can meets a welsh spade and they decide to plant a tree; the Lochness Monster emerges from the depths and makes sounds before diving back down again; a seagull with a broken wing asks a man for a new wing and when he is finally given one flies off; a tiger fights another tiger then a dragon and then tries to kill a fly but knocks himself out while doing so, the fly is finally eaten by a chameleon; the frog from the lion's throat reappears to sing a song, then jumps into the throat of a professor giving a lecture. Animals and Objects: a cow meets a cow and that cow is replaced by a bigger cow etc. : the cows get bigger and bigger! A chair believes itself to be a cat, a boot becomes a dog, so the chair becomes a snail, a pair of sunglasses becomes a car which meets a fish, a table becomes an aeroplane. The Ant Song: an ant is stuck on a hill. His friend the elephant tries to get him down but his trunk is too short, so he sends a balloon up to get the ant, but the balloon comes down, so his giraffe friend comes to help but the giraffe's neck breaks, finally his giant friend picks the ant up off the hill and sets him back down. To thank his elephant friend the ant gets his ant friends to make him a ladder. The elephant is delighted as he can now paint his bathroom blue! Many years later the spade and watering can meet up again: they look very old, but the tree which they planted is big and strong and to thank them for its existence makes them young again. 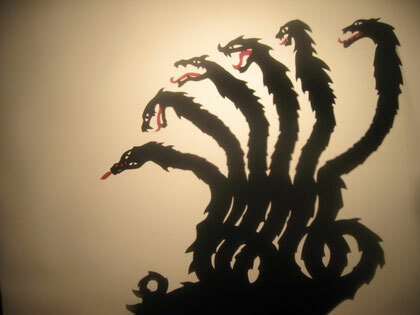 Shadow Theatre Show for children. Show for all the family. Original creation June 2010 (no recorded music). One day a crocodile encounters a villager on the banks of the river and smells the chocolate cake that she has just made. He quickly becomes a chocaholic and orders her to bake him cakes everyday. Soon there are no more cocoa pods on the cocoa palms so the Fans decide to move away from the river. The crocodile pursues them and on his way meets a hippopotamus, an elephant, a tiger and a snake who all give him directions to get to the new village which they have set up. Finally he gets there and since there is no more chocolate to be had out of them orders the chief to give him his daughter. Instead of eating her they marry and have a son called Gurangurane. When Gurangurane grows up he realises that he is half human and half crocodile. One night lost in the jungle he meets the elephant who listens to his misfortunes and advises him on how to get rid of his father who continues to be a threat to the village. Gurangurane manages to kill Ombure, and this event is a cause for much celebration in the village. The body of the crocodile is made into a boat. Adapted from an african tale. Silhouettes and coloured shadows. Two puppeteers and one musician: Emanoo. Performed at The Avignon Festival 2007. See l'Arbre a Soleils by Henri Gougaud for a full version of the story. At the end of each show the puppeteers invite the audience to come behind the shadow booth and see how the puppets are operated. To get rid of Perseus King Polydectes sends him on a quest to bring back The Medusa's head. This is a well known impossible task because whoever beholds her is immediately transformed into stone. During his travels he meets Atlas (who holds the sky) and the three Graeae (three blind cousins of the Medusa who share an eye). He finds the helmet of darkness which can make its wearer invisible. He uses this to get close to the Medusa and is thus able to cut off her head. 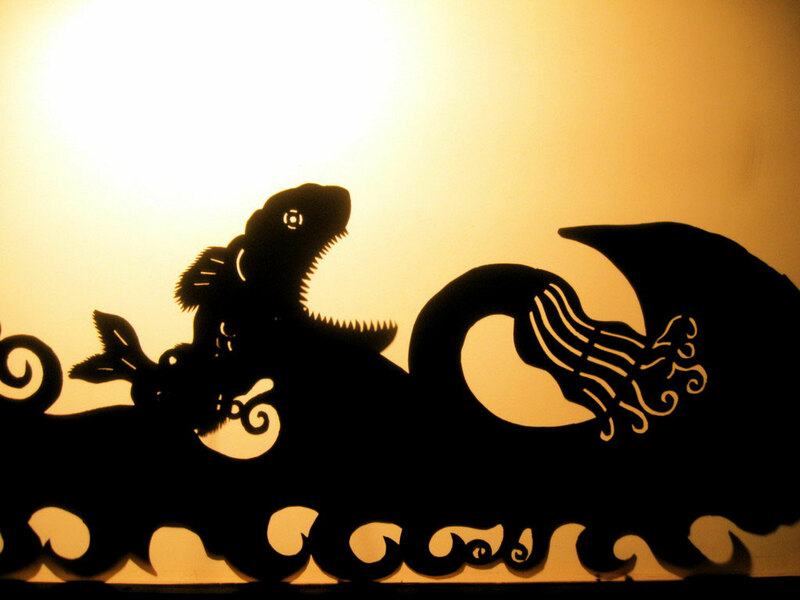 On his way back to Seriphos he meets Andromeda and saves her from the Ketos - a sea monster. King Polydectes and his subjects are surprised to see him back again and as usual laugh at him. They are immediately transformed into stone by being shown the Medusa's head. A free and comic adaptation of the greek myth in silhouettes. To be performed in conjunction with either The Fisherman and His Wife or The Princess Labam. Two puppeteers, live sound effects and recorded music. One day a fisherman catches a fish which can speak. It asks to be set free as it is the King of the fish. When he gets back home the fisherman tells his wife about the encounter. She scolds him telling him he should have asked the fish to grant him a wish before letting it go, for example it would be good to live in a nice big house instead of their dirty little hovel! The next day the fisherman goes back to the place where he caught the fish and calls to it. The fish grants the wife's wish but after only a few weeks of living in the new house with a TV and washing machine she gets tired. It would be so much nicer to live in a chateau with her own guards and have a private discotheque in the cellar! The wish is granted. But then coming to think of it a palace would be even better than a chateau, then she could become Queen. But being Queen would be tiresome, why not just go ahead and become Pope straightaway? 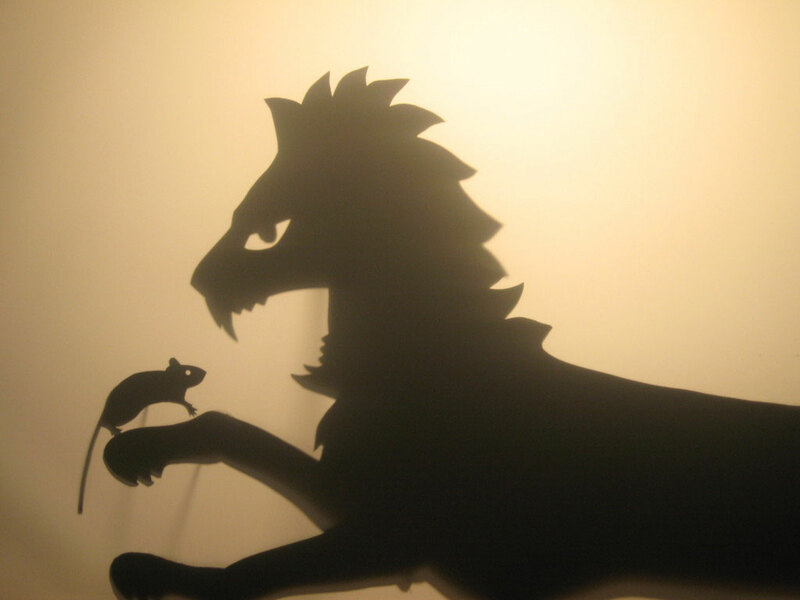 This tragi-comic story is freely adapted from Brothers Grimm. It can be performed in conjunction with another shorter show such as The Princess Labam or The Story of Perseus. Two puppeteers can perform this show using live sound effects and recorded music. The ocean that the Prince must cross to get to the land of the Princess. There was once a Prince who was told by the King of the parrots about a beautiful Princess living in a distant land. He sets off on his elephant in search of her and on his way meets a snake, a tiger and a magic bed. It is the magic bed which takes him to the Princess's land. However when he asks for her hand in marriage the King immediately sets him three tasks: to crush 80 pounds of mustard seed, fight a dragon and lastly kill a terrible ogress! Freely adapted from Joseph Jacobs' Indian Fairy Tales (1912). 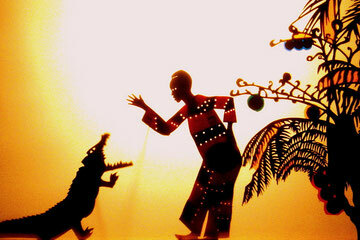 Performed by two puppeteers using live sound effects and recorded music. 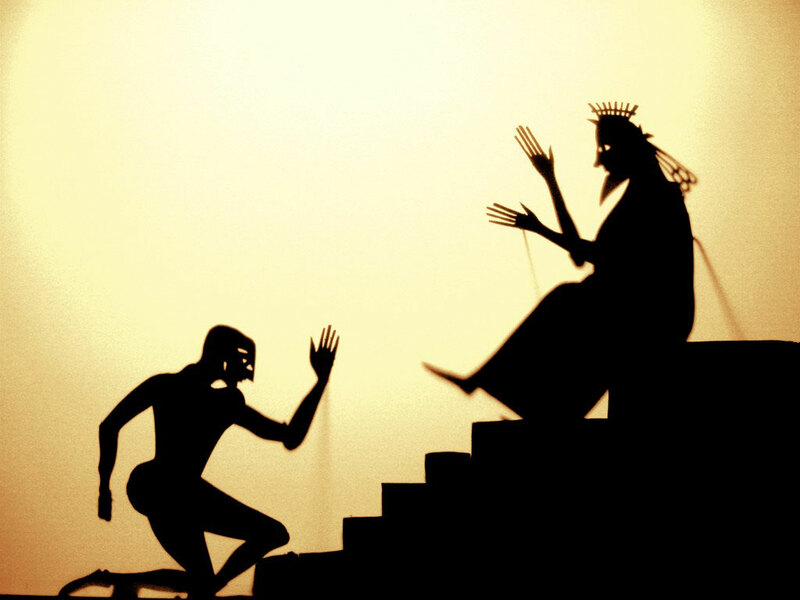 This story can be performed in conjunction with another short story such as The Fisherman and His Wife or The Story of Perseus.